Reality aside, A Beautiful Mind is the perfect film that will have viewers questioning reality from make believe until the credits roll. And now, with hours of bonus material and a flawless 1:85:1 anamorphic widescreen transfer, the film is more entertaining than ever thanks to a two-disc DVD release as memorable as the film itself. "A Beautiful Partnership: Ron Howard and Brian Grazer"
"Casting Russell Crowe and Jennifer Connelly"
"The Process of Age Progression"
Loosely based on events in the life of mathematician and Nobel Prize Winner John Forbes Nash, Jr., A Beautiful Mind is an emotional journey through the life of a genius who to this day has a difficult time distinguishing reality from make believe. A paranoid schizophrenic, Nash (played perfectly by Academy Award winner Russell Crowe) lives his life in confusion trying to figure out where reality ends and his imagination takes over. Although medication temporarily relieves Nash of his delusions, they also take Nash away from his real life — his abilities to be a loving husband, a caring father and a knowledgeable professor. Determined to beat the disease that took away his career without relying on drugs, Nash turns to his own troubled mind and the love of his patient wife (Jennifer Connelly) to regain control of the mind that won him the Nobel Prize. Running a little over 2 hours in length, A Beautiful Mind takes its time to develop both of Nash’s worlds completely. Although some people complained about the differences between A Beautiful Mind’s John Nash and the real John Forbes Nash, Jr., screenwriter Akiva Goldsman writes a beautiful script that will capture audiences’ hearts and inspire them to read about the real John Nash on their own time. While the story could have easily been slow-paced and confusing, Goldsman ties up all lose ends and moves the story at a fairly steady pace. Nevertheless, it’s the performances by Crowe and Connelly that made this film a guaranteed Oscar winner, and in my book should have made Crowe a back-to-back Best Actor Oscar winner. Russell Crowe gives the performance of his career as John Nash, Jr. From his earlier days as a troubled mathematician trying to discover the formula that will make him a success to his later days as a man plagued by visions that don’t exist, Crowe transforms on-screen from a brilliant loner to a paranoid and sick individual with such ease that one will forget they are watching a movie. The mannerisms, the stuttering, Crowe brings all the clues that Nash was sick even during his days at Princeton to life so that viewers who may not know the real John Nash will be clued in from the start that something isn’t quite right with him. Additionally, there are no jumps in Crowe’s performance to take viewers out of the story being told. Everything he says and does is a continuous downward spiral until his final fight to regain control of his own mind, making his performance impossible not to believe. Even his make-up transforms him from the young, New Zealand native the public has known these past few years to a senior citizen so believably that it’s hard to acknowledge the fact that the man underneath the gray hair and wrinkles really is Russell Crowe. Meanwhile, Jennifer Connelly, who was overlooked by the Academy for her role in Requiem for a Dream, gives one of the strongest female performances of 2001 as Nash’s wife, Alicia. Even during the couple’s bleakest moments, Connelly continues to show either through her gestures or the emotion in her voice her undying love for Nash that eventually helped him regain control of his life. Viewers will never once feel like she wants to run away even when she questions it herself, and that’s what makes the couple’s battle even more emotional to watch. A movie as spectacular as A Beautiful Mind truly deserves a DVD equally as entertaining and insightful, so it should be no surprise that Universal created a two-disc awards edition worthy of being attached to 2001’s Best Picture. 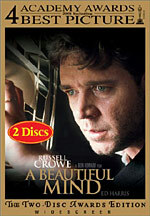 The Beautiful Mind DVD is loaded with extra features, including almost 30-minutes of deleted scenes with optional director’s commentary. Although some of the deleted scenes are simply extended or alternate takes on certain sequences, many actually trace back Nash’s first symptoms of schizophrenia to when he was a student at Princeton. Seeing Nash deal with his condition in more detail and at such a young age is both interesting and educational to watch, especially since the first symptoms of the disease tend to appear in a person’s early to mid-twenties. Furthermore, as Ron Howard discusses on the commentary track, the scenes that ended up on the cutting room floor were removed from the film due to time constraints— not because the scenes weren’t well done. A few of the scenes even add a different twist to the story, causing fans who’ve already seen A Beautiful Mind to second-guess themselves once again at what’s real and what’s really make believe. The Beautiful Mind DVD also contains seven featurettes on the making of the film itself, tracing everything from the casting of Crowe and Connelly (and the challenges of getting Crowe’s schedule to coincide with the shooting schedule for A Beautiful Mind) to the partnership of producer Brian Grazer and director Ron Howard. The most interesting featurettes discuss the special effects and scoring of the film. “Creation of Special Effects” takes a look at the various special effects that were used in the film, pointing out some special effects shots that would have gone unnoticed if they weren’t brought to the viewer’s attention because they seem so natural. Those who have already seen the movie will almost feel foolish for not noticing these shots beforehand, especially since once they are mentioned it’s so obvious that they were digitally created. Meanwhile, “Scoring the Film” takes an interesting look at how composer James Horner scored the picture. Working alongside Charlotte Church, Horner discusses how he recorded both the orchestra and Church together rather than adding Church’s vocals at a later time. The featurette includes behind-the-scenes footage of the recording sessions as well as exclusive interview clips with Howard and Church on their working relationship with Horner, allowing viewers a rare glimpse into the process of scoring a film. Unfortunately though, viewers will have to go back and watch the film again to truly appreciate the movie’s score since the “Beautiful Mind Soundtrack” feature on the DVD is merely a commercial for the CD rather than the soundtrack itself. Two other featurettes worth noting are the “Storyboard Comparison” featurette and “The Process of Age Progression.” The storyboard comparison featurette is particularly interesting since it shows storyboard comparisons for scenes that are in the movie as well those that ended up on the cutting room floor. And for viewers who find the special effects featurette entertaining, “The Process of Age Progression” takes the process one step further by focusing on the make-up effects that were created to make Crowe and his co-stars age realistically. Naturally, the DVD for A Beautiful Mind wouldn’t be complete without footage of the real John Nash, Jr. Amongst the hours of bonus features the DVD includes is a clip from the real Nobel Prize acceptance ceremony, footage of Nash explaining his analysis of equilibria in the theory of non-cooperative games to Howard and behind-the-scenes footage of Nash and his wife, Alicia, on the set of A Beautiful Mind. However, while seeing the real John Nash, Jr., will pique viewers’ interest, those expecting to see Nash’s tear-jerking acceptance speech at the 1994 Nobel Prize Ceremony will need to look elsewhere since the footage of Nash accepting his Nobel Prize is merely just that — Nash taking his award and nodding his head in appreciation. Other bonus features on the two-disc set include: two feature-length commentaries (one by Howard and one by Goldsman), a 30-minute making-of feature that summarizes the various featurettes on the making of the film, cast and crew bios, the film’s theatrical trailer, “The Development of the Screenplay” featurette, production notes, clips of Howard, Grazer, Goldsman and Connelly at the Academy Awards (both televised and backstage) and advertisements/sneak peeks of the bonus material on four other Universal DVD releases, Patch Adams, Apollo 13, K-Pax and The Family Man. Whether you are one of the millions of moviegoers who saw A Beautiful Mind while it was in theaters or someone who is experiencing the engaging and suspenseful story for the first time, A Beautiful Mind: The Awards Edition is a must-own DVD for your home video collection. A movie that can be enjoyed time and time again, the film is not only that rare Hollywood blockbuster that’s both entertaining and educational to watch, but also the perfect example of a movie worthy of all the critical acclaim it’s received.